I’ve been walking around Toronto officially with Torottawalk for a fall and winter, learning how to be more mindful and attentive about my city, learning to be inquisitive and appreciative, and learning to take really great photos with a cellphone camera. What I’ve found amazing: how ancient some places around my home are, how connected I can be to nature in the middle of a whirling dirvish of a city, and the absolute dearth or resources to guide me on walking. I’m looking at you, Discovery Walks. 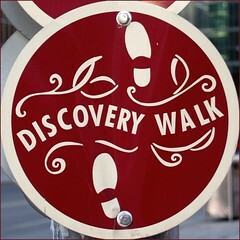 Discovery Walks is a program of self-guided walks that links City ravines, parks, gardens, beaches and neighbourhoods. Other Discovery Walks include: Central Ravines, Belt Line and Gardens; Don Valley Hills and Dales; Western Ravines and Beaches; Northern Ravines and Gardens; Eastern Ravine & Beaches; Garrison Creek; Humber River, Old Mill & Marshes; and Uptown Toronto. What discovery walks doesn’t include: history. education. Along the walk you’ll notice signage is sun bleached and graffiti ridden; directions haven’t been updated, and – most frustrating – it could be so much better. Encouraging pedestrian-ism, walk-ability and livability in this city is of utmost importance: start with taking Discovery Walks and using the existing infrastructure to support more. Mashing up the Discovery walks with a smartphone application like the Local History App “It Happened Here“, integrating Stroll, Jane’s walk, or Toronto City Library Genealogy & Local History tools into an application – or more cheaply: stick a QR code onto any discovery walk sign and link it to a map with local history. which is why I started Torottawalk. in part to connect with far away friends and in part to connect with the cities I love.